My "itch" for a new project has lead me to our bathroom. 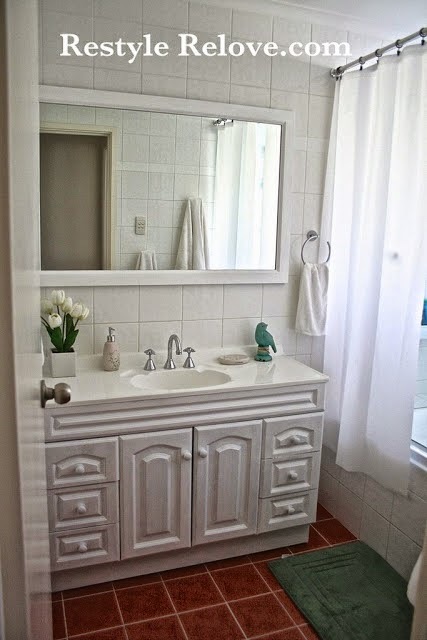 This is the last photo taken of our tiny bathroom a year and a half ago when I repainted the vanity white. Not much has changed, but there are a few projects I want to do in here and I'll be sharing them with you in the coming weeks. Today I'm focusing on the vanity. I have painted it a number of times. It's currently white but the paint has been starting to peel off so I thought it was time for a makeover! 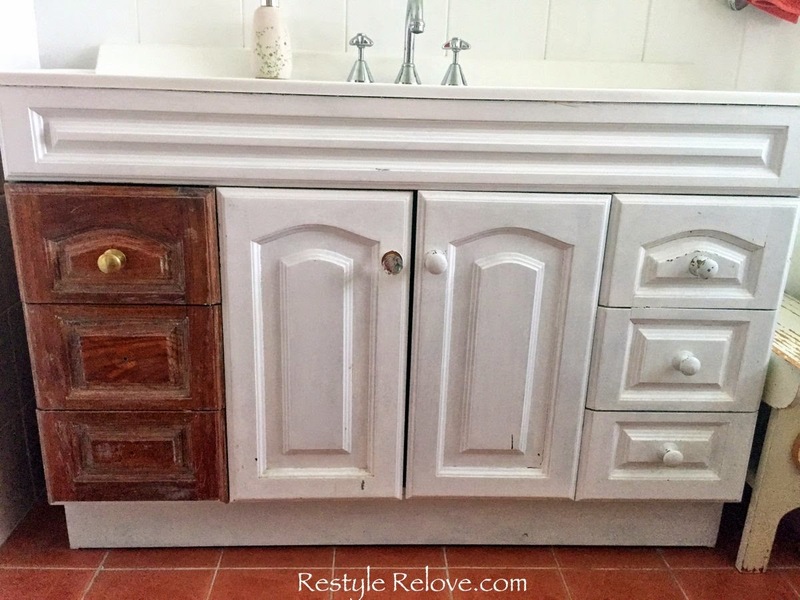 I sat down for almost 2 hours and scrapped the paint off 3 drawers, before deciding bare dark wood was not the way I wanted to go and that repainting would be easier, faster and a whole lot less messy. I'm thinking of sanding any flaking, then applying a coat of Zinsser 123 undercoat. And for the top coat, probably white again. I did green before so I'm thinking I can't do anything that drastic again. I considered grey but we don't have anything grey in the rest of the house and I'm not sure what, if anything, would go with our "lovely" (said sarcastically if you can't tell) orange tiles. 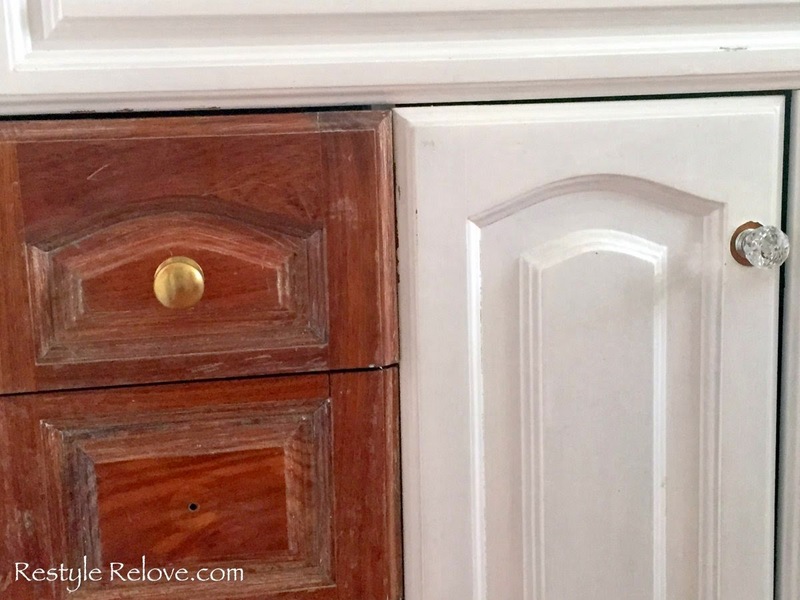 I also started removing all the paint off the drawer knobs, then decided that gold knobs don't really go with silver tapware, so I'm now considering swapping the knobs with crystal ones that have a silver base. The ones right in this photo below. While I decide, I'm praying we don't have visitors who need to use the bathroom. What a mess! 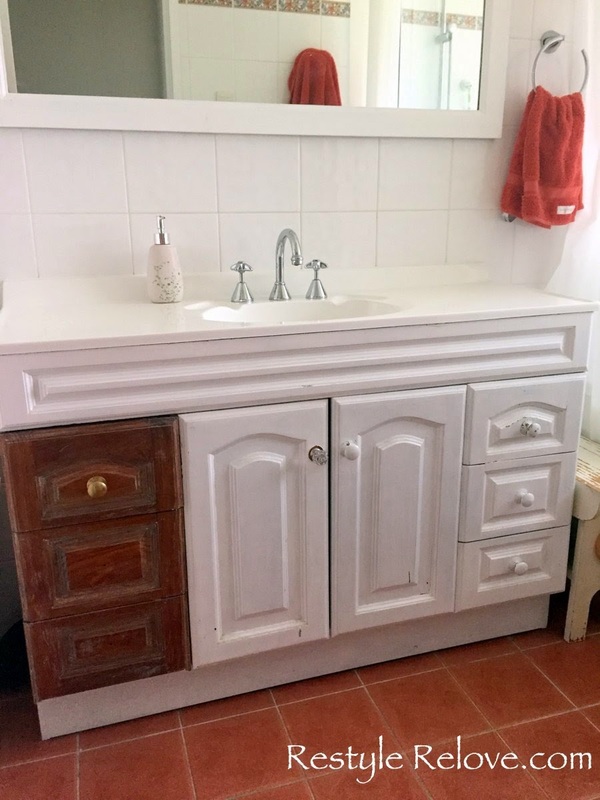 Update: See completed vanity here! You bathroom is going to be super pretty. Love the crystal knobs that would look so pretty. Good luck. I know it will look awesome. I bet it will look great when you are done Julie-good luck! It will be beautiful when you're done no matter what you decide. Have you considered replacing the orange tile? For a small bathroom it wouldn't be that big of an expense.